For this judge, justice is best served unconventionally. 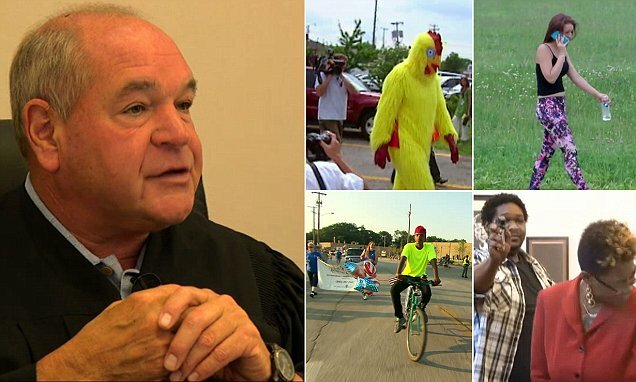 From making a man wear a chicken suit to having a woman get sprayed in the face by what she thought was going to be pepper spray, Judge Michael Cicconetti has become a viral sensation for his unique method of sentencing. Just last month, the municipal court judge got international media attention for giving 18-year-old Victoria Bascom the choice between 30 days in jail or walking 30 miles after she didn’t pay a cab driver for a 30-mile trip. But creative punishments are not new to the judge, who can see 30 to 40 cases a day from his Painesville, Ohio, courtroom. Cicconetti said he doesn’t believe the law as it is written can really be the only way to serve justice. And for the most part, Cicconetti’s type of justice appears to be working in Painesville. Nationally, the recidivism rate after incarceration is over 75 percent, with close to 50 percent of ex-convicts committing a new crime that can land them back within a year, according to a 2014 report by the U.S. Department of Justice. But Cicconetti claims to have a recidivism rate of only 10 percent. He believes the key to his low number is his approach on making the punishment fit the crime. For Alyssa Morrow and Jordan Walsh, Cicconetti’s sentencing is a better alternative to jail time. Instead of spending 90 days in jail, Judge Michael Cicconetti gave Alyssa Morrow the choice of spending eight hours in a dump picking up garbage. Morrow recently pleaded guilty to animal neglect and cruelty after she said she left her 7-year-old pit-bull mix named Moose for a week in a house that could be described as belonging to a hoarder. Moose is now up for adoption. Instead of spending 90 days in jail, Morrow chose Cicconetti’s other punishment of spending eight hours in a dump picking up garbage. And Walsh, who pleaded guilty to stealing a bike, avoided spending 60 days in Lake County Jail by choosing the alternative sentence of ten days of community work service. Cicconetti ordered Walsh to ride a bike on behalf of a local charity in a parade for one of the days of service. Judge Cicconetti ordered Jordan Walsh, pictured here, to ride a bike on behalf of a local charity in a parade as one of his ten days of community service instead of spending 60 days in the county jail. Thanks to Cicconetti’s sentence, Walsh was also happy to have a second chance. “I’m [going to] make sure to not make mistakes or never do something like this or ever take a bike again and show people I can do better and make a better living for my life,” said Walsh. ← Spaying/Neutering is Up, Animal Populations in Shelters are Down Across the U.S.